In April 18, 1506, Pope Julius II laid the cornerstone for a new basilica church over the burial place of St. Peter the Apostle in the Vatican. A great lover of the arts and a patron of artists, Pope Julius hoped to accomplish what Pope Nicholas V had begun fifty years before; namely, to replace the aging St. Peter’s Basilica (built by the Emperor Constantine) with a new church resplendent with Renaissance architecture and art. A year later, Pope Julius proclaimed a Jubilee Indulgence to fund this great project. To obtain an indulgence, one must be truly repentant, receive the Sacrament of Penance, and perform a good work. In the case of Pope Julius II’s jubilee indulgence, the good work consisted in contributing money to the building of the new St. Peter’s Basilica. Although it was not unusual for the Church to issue indulgences for the funding of churches, which was considered a very holy work, in just a few short years this jubilee indulgence would yield tragic results that no one, not even the pope, could foresee in 1507 (but that’s for another article). Pope Julius II was a bundle of contradictions. He took his duties as the head of the Church seriously, fighting against abuses such as simony and nepotism, even calling the Fifth Lateran Council in 1512 to reform the Church. And yet, before becoming pope, Julius II had engaged in bribery to ensure he became pope—and, after becoming pope, he personally led armies into battle to protect and extend the political power of the Papal States. In sum, Pope Julius II tended to focus more on the temporal than the spiritual good of the Church—a problem that had been afflicting the entire Church since the days of the Avignon popes. By the 16th century, too many churchmen seemed to have forgotten their spiritual offices in their pursuit of political power and wealth. Benefices did not go to the holiest or even to the most learned men, but rather to the wealthiest and most powerful. Bishops of the time often cared little for the spiritual good of those entrusted to them. Too many of their priests were little better, and many were ignorant and immoral. Even many monks and friars were living lax lives of pleasure and self-indulgence. Far worse, the Roman curia and the popes themselves of this era were in large part the cause of such ills. For example, to become a bishop at that time one often had to pay a large sum of money to Rome—which meant only the richest (or those with the richest friends) would be made bishops. The pope, too, often allowed one man to be the bishop of more than one see— something forbidden by Church law—or to be bishop of a see in a country he would never visit. Churchmen at all levels had grown comfortable in the practice of nepotism and simony. In Rome itself, cardinals openly lived immoral lives, while the popes spent their energies in extending their political power or patronizing the arts. In those days, one still could find holy priests, conscientious bishops, and strict monasteries. But the Church as a whole was sick. The laity likewise suffered from ignorance and immorality. Some humanist scholars, particularly in Germany, openly mocked the Church and churchmen. Kings and princes thought chiefly of their personal power, wealth and making themselves almost the absolute lords over the Church in their regions. Many believers, both lay and clergy, believed that a reform of the Church was necessary. They sought a reformation, similar to the great medieval reformation. But who would lead such a reform movement? 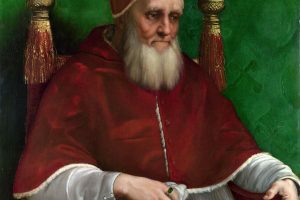 Though Pope Julius II called strongly for reform, he died in 1513, four years before the end of the reform council he had called. Though there were many critics of the Church, nowhere in Europe could be found a king, a bishop, or a religious order to lead in the reform of the Church. Even so, the faithful of that time still hoped and prayed for one. A song titled L’homme Armé (“The Armed Man”) was very popular in the late 15th and early 16th centuries — so popular that composers used it as the basis for Mass compositions. Imagine going to Mass and listening to see if you could detect the tune of your favorite song in the Kyrie, Gloria, Sanctus, or Agnus Dei! This is what people of the time did. The video, below, presents a performance of the original song, L’homme Armé, followed by a Missa L’homme Armé, composed by Guillaume Dufay about 1460. This column is provided to give historical perspective to the challenges we face in living out the faith in our current era. This piece is culled from Light to the Nations I: The History of Christian Civilization, a textbook in the series of highly praised history textbooks for Catholic Schools produced by Catholic Textbook Project, now used in schools in more than 100 dioceses and internationally. For more information about these textbooks, call 888.610.3354.